We’re trying to take advantage of the last few weeks of daylight savings time and mild temperatures by using the grill whenever possible for dinner. While Brandon is a year-round griller, it’s just more enjoyable to be out there in daylight and not shivering! We’re always looking for ways to mix it up on the grill so we’re not always preparing the same grilled chicken, fish, steak, veggies, etc. Luckily, we have some great resources for inspiration and while flipping through The Cook’s Illustrated Guide to Grilling and Barbecue, I came across this recipe for Tandoori-Style Chicken Breasts. I really enjoy ethnic foods and I was especially excited for the opportunity to use the turmeric and coriander that are usually pushed to the back of the spice cabinet. This chicken features a thick coating of a very flavorful spice rub. The tandoori effect is achieved by getting the grill really hot and starting the chicken on high heat before moving it to a cooler side of the grill. The yogurt sauce is the perfect finish and a nice contrast to the chicken. 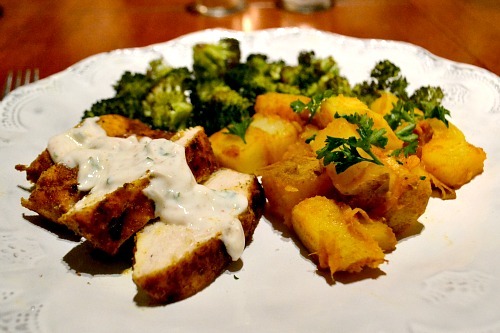 I served the chicken with Indian-Style Potatoes from Epicurious and roasted broccoli. Whisk together all ingredients and season to taste with salt and cayenne. Place in fridge until ready to serve. Prepare grill. If using gas, preheat by turning all burners to high and closing lid. Mix together ginger, coriander, cumin, turmeric, cinnamon, 1/2 teaspoon of salt and 1/4 teaspoon of cayenne together in a small bowl. Rub chicken breasts with olive oil and then generously coat with spice mixture. If using gas grill, leave one burner on high and turn others to medium low. Place chicken on hot part of the grill until well-browned, 2-3 minutes with the lid down. Move to the cooler side of the grill and continue to cook for another 10 mninutes. Turn and cook for 5 more minutes or until done. Internal temperature should read 160 degrees. Note that we cooked this on the Big Green Egg and used a similar technique to the above by moving chicken to a cooler part of the grill after the first few minutes and cooking with lid down. Let chicken rest for 5 minutes and then slice. Serve with yogurt sauce. This looks relish! And, isn’t it funny how most people hate or love cilantro? I’m on the hate side, it ruins a meal!! I’ve been meaning to pick up some of those Indian spices and this recipe just may have convinced me! Yum!